With the week-end coming, to do lists get more and more oppressive. 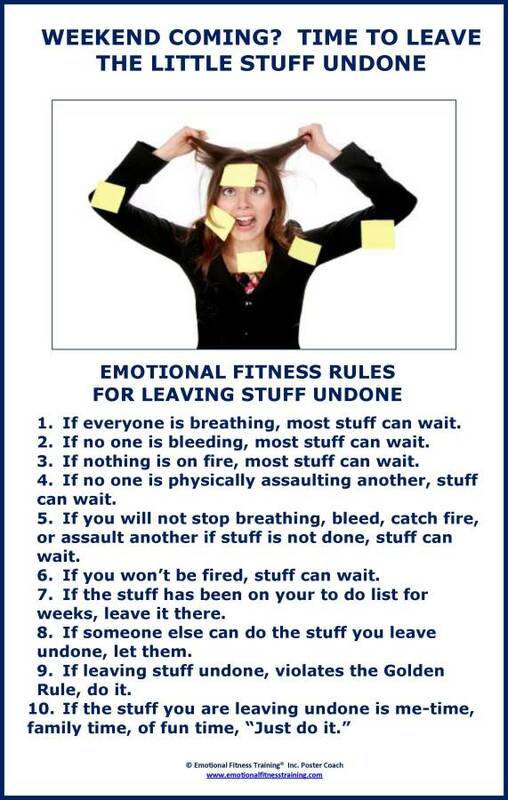 This funny Emotional Fitness Poster Coach says ditch the small stuff on your list. When making your to do list, make the first priority taking care of you so you can take care of others. Next week’s free eBook is When Good Kids Takes Risks. You can download it starting today and going through Tuesday June 11th. See the side bar. This entry was posted in Parenting Issues and tagged Emotional fitness, Emotional Fitness Training, Emotional Health, Katherine Gordy Levine, Life, parenting, Parenting advice, Parents Are People Too, postaday, Self care, Self-care, Take A Break, Thinking about what matters. Bookmark the permalink.